Oddly enough, life is quiet now only two days away from Christmas. Having some time off, I've been working with simple materials: papers, fabrics, text from an old Italian dictionary, small bits of willow branches found on my morning walks. I'm hoping to take part in the International Collage Exhibition and Exchange run by Dale Copeland. It's been a few years since my last participation, so it's time to bring out the boxes of papers and such. 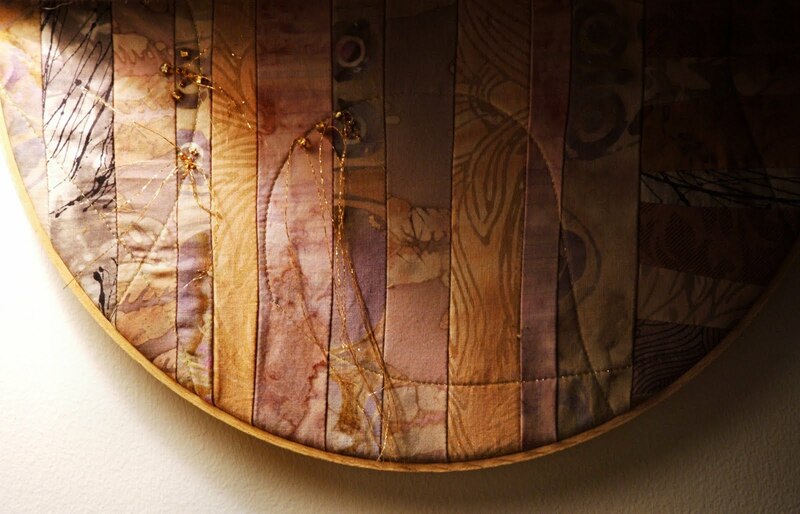 The work above is mainly created from specialty papers from Nepal and India, some bits of marbleized papers, scrap fabrics from the quilt stash and a slender piece of Japanese silk yarn around the perimeter. 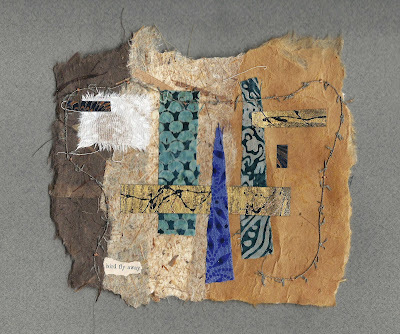 I then stitched the collage onto Canson pastel paper using another Japanese paper thread. 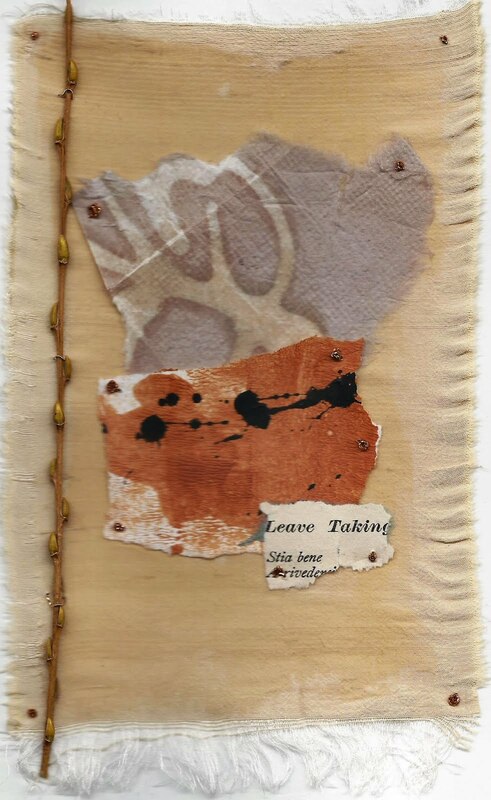 Leave Taking is built upon a scrap of silk dupioni using papers, a bit of a monoprint I did last year, Italian text and a willow branch stitched down with copper on Bristol paper. 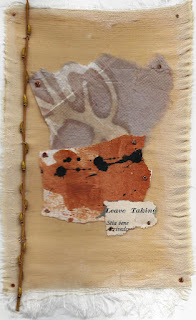 I love the contrast between the fragile silk and the papers and copper stitching. I hope to work on some more over the coming weeks. I think participating in an exchange/exhibit keeps one focused and on track. I find that I need that type of structure to discipline myself -- otherwise, I fiddle and procrastinate. 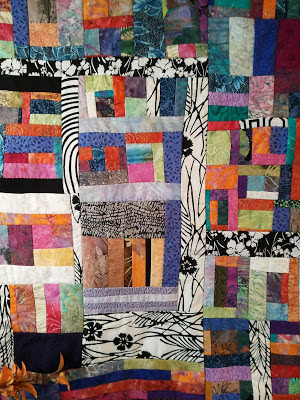 Quilting is another form of building with simple materials. This is a glimpse of a smaller work I did years ago, but became impatient to finish it as a full-scale quilt. So I framed it in a wooden embroidery hoop and hung it on the wall by the fireplace. Now when I'm on the couch reading or doing more hand-stitching, I look up at this and feel good about its simple lines and monochromatic colors. In an all-together different vein, this is a mid-sized wallhanging quilt, mostly done over several summers at Cape Cod, hand-stitched and then machine-stitched into a larger piece when I had finally accumulated enough blocks. There was never any pattern except for the basic log cabin pattern. It is certainly not symmetrical; perhaps a bit wonky here and there -- but it makes me smile when I look at it, thinking of those summer days at the Cape and how the slow stitching and piecing kept me sane while raising teenagers -- need I say more? Collage and quilting -- a process of building, of piecing, of working with colors and textures, with surface and design. Don't you just love it? So nice to read this post...like your fabric work! I've been working with fabrics this fall & winter...it is a whole different way of art making! Happy Holidays!